A Very Different Nativity Tableau! I know we spend quite a lot of time in church so I suppose I shouldn't be too surprised when Bible stories feature in my children's imaginative play. But I had to laugh when they showed me their rather alternative Nativity Tableau with some characters that Mary and Joseph might have found a bit scary if they had turned up at the stable some 2000 years ago! In fact even Mary and Joseph have gone a bit 2013- Joseph in his jeans and Mary in what looks suspiciously like red hot pants. Mary has apparently just given birth to a Moshi Monster. Or is it a GoGo Crazy Bones thing? No wonder the new parents are studying their "baby" very closely! 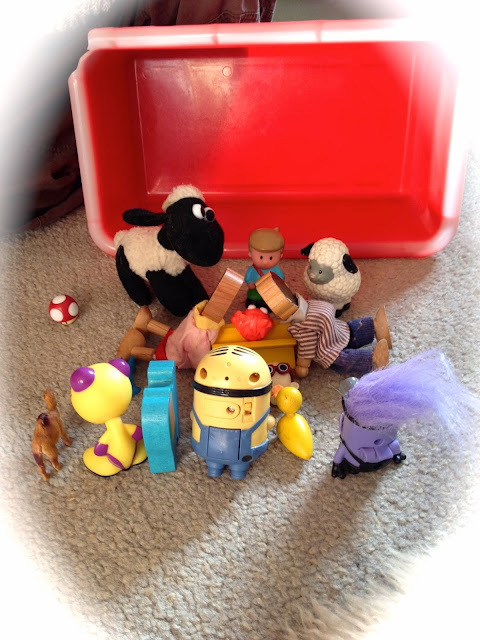 We have wise men - two of them are Minions and the other is...... is it another Moshi Monster? One at least seems to have arrived on a traditional camel, the other I think has a blue wooden elephant and oddly the other is accompanied by a small yellow duck. Are duck's any good at long desert treks? The shepherd is somewhat dwarfed by one of his sheep, who I'm sure I've seen starring in a well-known animation. And instead of choirs of angels we seem to have a Mario Bros mushroom and a few more GoGo's. The stable I feel is an improvement on the original - at least the plastic would be waterproof if it rained. My two youngest spent a long time assembling this, and even longer playing with it. I love that in this age dominated by computer games and TV they are still fascinated and entertained re-telling one of the world's oldest stories using bits of plastic tat, mostly acquired at a fast food emporium! 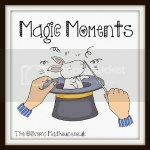 This post is linked up with #whatsthestory and #magicmoments. Click the badges for more great blog posts. This is just the sort of thing my son would do except that because he's a bit older Mary and Jesus would be visited by transformers or something and King Herod would be Darth Vader. Brilliant! My four older children (2 to 8 yrs) are very impressed! I love this! Liking those wise minions! Afra this is amazing! i absolutely love it!! How fab! We need more nativity scenes like this to inspire kids.